Even as villages have gone dry, the government has not yet extended any support. The camp is also struggling to cope with the exodus. Mhaswad, Mann Taluka, Satara: Gangoti village in Maharashtra is dry and parched. The fields of maize, bajra and pulses in the lands in and around it has all withered. There is not a drop of water in the nearby village pond; the wells and taps too have been running dry. The block division officer (BDO) of the Man Taluka in Satara district – under which the village falls – had at the beginning of the year promised that a tank with potable water would be ferried here every three days. But even in the fourth week of the month, there is no sign of one and the villagers here continue to struggle for a little bit of water. In November, last year, chief minister Devendra Fadnavis declared 112 talukas as severely drought hit. While most of them are in the Marathwada and Vidharbha region of the state, Man in the western region is one of them. This year’s drought is predicted to be of the worst kind. Even worse than the one faced in 1972, says 73- year old Ramhari Jhimmar. “As far as I remember,” Jhimmar says, “January has always been a month of harvest. But this year, we have no produce.” Since 2017, most farmlands are lying vacant. “Some who managed to cultivate maize in their small patch of land have also lost everything. Lack of water has destroyed it all,” he adds. As a desperate measure, Jhimmar has sent away his two buffaloes and a cow to a cattle camp set up four kilometres away, as have the others in the village. Almost all of the 400-odd houses in Gangoti village are locked – the adults have moved away with their cows to the cattle camp run by Mann Deshi Foundation, an NGO working towards the economic empowerment of women in rural Maharashtra. “Just move around the village and you will see that all houses are locked. Only handful of us frail, old men are left behind along with a few school going children. The adults have all moved to the cattle camp,” says Anandrao Wirkar, an 80-year-old farmer who owns four acres of barren land, two Khillari bulls and one Jersey milch cow. 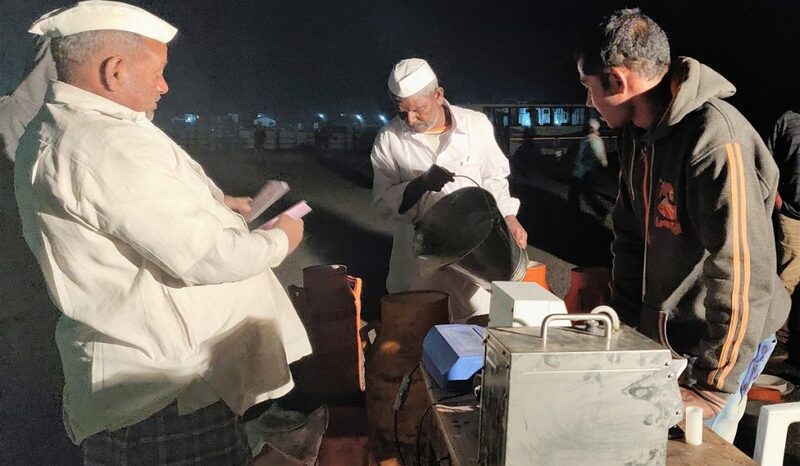 This year, the cattle camp or chavnni, as commonly known in the region, was set up in January by Mann Deshi, in collaboration with the Bajaj Foundation and two other organisations. Spread over 100 acres, it now has over 7,800 cattle taking shelter, with more coming in every day. These cattle are neatly arranged in rows with 40-50 cattle in each row. Along with the cattle shed, smaller tents – made out of cloth and flimsy tarpaulin – are built in which families take shelter. People can be seen working through the day, chopping sugarcane and preparing wet fodder for the cattle. Every morning and evening, private dairy owners visit the camp to collect milk at a centre set up near the camp. People are seen lining up with their small milk cans. “An effort is made to make everything seem normal here. Like in our villages, milk collection is carried out twice every day,” says Rekhabai, of Hingani village, 13-kilometres away. There has been a drop in milk collection. “It is a new place. Like us, animals too sense a change in the location. My four jersey cows would give nearly 20-22 litres of milk, which has come down to just 14 litres now. But I am glad I still have them and they are surviving,” a villager told The Wire. Cattle from across 58 villages of Man and Khatav talukas in the sprawling district of Satara and the neighbouring Atpadi taluka of Sangli have been moved here. Farmers and cattle owners from as far as Aurangabad and Beed too have been visiting the camp and asking for support. The organisers say they have a capacity to shelter around 20,000 cattle, but going by the speed at which farmers are moving to the camp, that figure will be reached soon and it might not suffice. The state is yet to step-in, complains Shantabai Wirkar, a farmer from Wirkarwadi village, who has been staying at the cattle camp for three weeks. “There is a clear crisis. We have no fodder, no water to feed our cattle,” she adds. On January 25, the state issued a government resolution to set up camps in the affected areas. Satara district collector Shweta Singhal told The Wire that the administration is still in the process of surveying the affected area in the district. “We will take some time to identify the areas which would need government support. The GR was issued only ten days ago,” Singhal said. “The real challenge would be in the months of April and May, when the summer is at its peak. We are afraid most villagers would be displaced in the coming months,” says Chetana Gala Sinha, founder of Mann Deshi foundation. Located in the eastern part of the district, away from the Sahyadri ranges, all 156 villages in Maan taluka and 60 villages in adjoining Khatav taluka fall in the rain shadow area and are perennially drought-prone. A fifth of these talukas consist of nomadic tribes, mostly belonging to Dhangar (shepherd) community, followed by other semi-nomadic and denotified tribes. The land holding in the region is small and most families here are dependent on their livestock for sustenance. As pastoral communities, those rearing sheep travel to neighbouring districts for the most part of the year. Only those with cows and buffaloes stay back. Villagers here say the migratory pattern of the region has seen a dramatic shift in the past few years. “Earlier, we would move to the neighbouring districts only post-Holi in March and return around Ganesh Chaturthi in August or September. Now you will see families travelling with their herds of sheep as early as January and returning only towards the end of the year,” says Mangal Mole of Motewadi village. This, Mole attributes to the crop failure and scarce rainfall in the region. While several from Motewadi have already moved towards the Karnataka border with their livestock, around 80 houses have moved to the cattle camp. The camp is set up on a large expanse of land. Smaller sections or wards are created and are numbered for easy management. Twenty five-year-old Sunita Wirkar has moved to the camp with two buffaloes, from Masaiwadi village, four kilometres from the camp. Her two-year-old son, a six-month-old daughter and her mother- in-law have also tagged along. Her husband, along with other men from the village, has shifted to Belgaum with their 12 sheep, Sunita says. A tarpaulin sheet doubles up as both shelter and playing area for the children. As the temperature dips in the evening, Sunita struggles to keep her children warm. “Back home, I did not have to worry about their food and health. The village Aanganwadi took care of them. My daughter has been catching cold ever since we moved here. But I do not have a choice,” Sunita tells The Wire. Like Sunita, several mothers have moved to the camp with young children. Migration and drought have both a direct impact on the wellbeing and the education of the children. Seasonal migration, coupled with unprecedented drought situations, have seriously affected farmers in the region, especially those from the migrant pastoral communities. In some instances, parents have left their school-going children back in the village with an elderly person from the family or a neighbour. But those who lack such support have carried their children along. “What can we do, anyway? 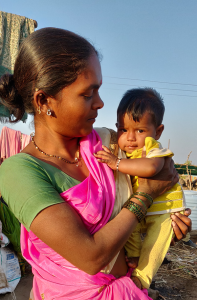 We would also like for our children to continue going to school but there is no one to feed them in the village right now,” Lalitabai Jhimmal tells The Wire. Her three children, in Classes VII, V and III, have been squatting at the camp along with her, intermittently attending their school. “There is no water in the village. Here, at least, we have water to drink,” says the eldest one. Sachin Menkudale of Mann Deshi says they are trying to set up an Aanganwadi near the camp. Omkar, who operates the cattle camp, says six water tanks have been organised. Four of these can store 20,000 litres each and the other two will bring 10,000 litres each. The local municipal council has arranged for drinking water. A veterinary doctor is available round the clock. Only a month ago, Namdas sold his Jersey buffalo at a village fair under distress. “I had no choice. It was getting difficult. I would have sold these too if not for the camp,” he adds. The last time a similar camp was set up in 2012, but only in March. “Families stayed in the camp for nearly 18-20 months then. This time they have arrived three months in advance and going by the rainfall pattern, we are anticipating a much longer stay this time,” Sinha, the camp’s founder, says.